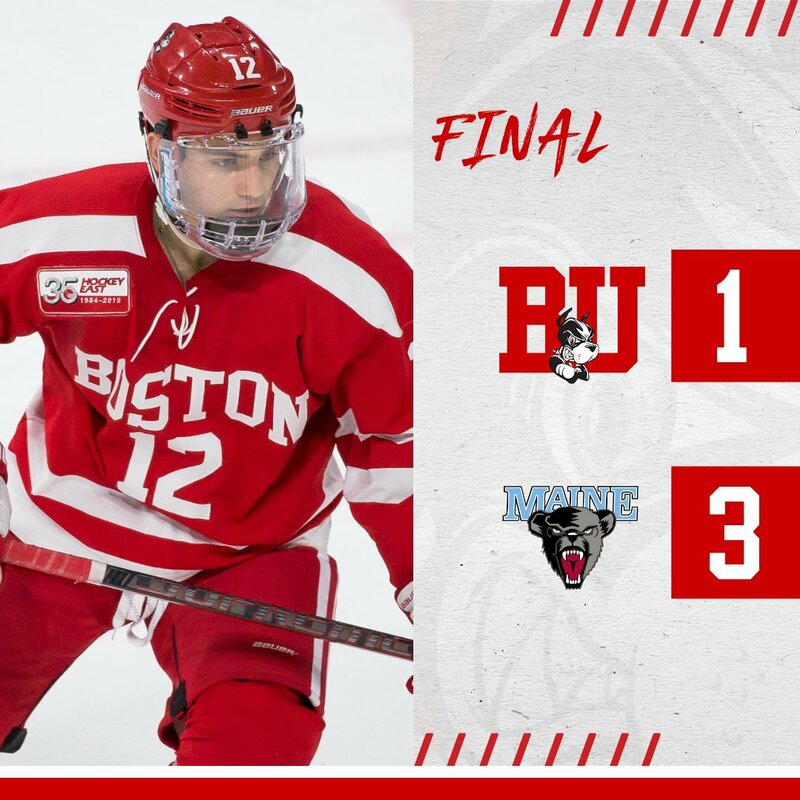 After scoring three goals against Maine goalie Jeremy Swayman in Friday’s win, Terriers were stymied by the Bruins’ draft pick on Saturday and dropped a 3-1 decision to the Black Bears. Swayman stopped 41 BU shots, including 28 over the final two periods. Bobo Carpenter’s team-high sixth goal was the only shot to beat him. After BU had held a decided early territorial advantage, Maine drew first blood on a power play midway through the first period. Jake Oettinger stopped Chase Pearson’s initial shot but Mitch Fossier gained position at the left post and buried the rebound. Maine doubled the lead early in the second period with the teams skating four men apiece as Pearson converted on a 3-on-2 rush. Halfway through the period, BU got on the board when co-captain Dante Fabbro sent the puck behind the Maine net to Logan Cockerill, who was slowed by a Maine defender. Carpenter picked up the loose puck and put a sharp-angle shot past Swayman, high to the glove side. 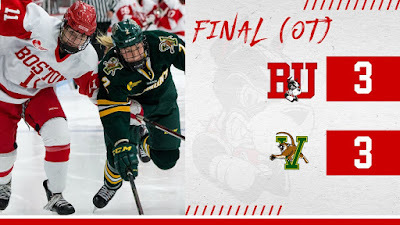 BU outshot Maine 28-14 over the final two periods, but couldn’t produce an equalizer. With less than a minute left in regulation, Swayman denied Shane Bowers and Pearson fired the puck the length of the ice into the empty Terrier cage. After scoring three power play goals Friday, BU came up empty on five attempts Saturday. Defenseman David Farrance, a key point man on the power play, and Maine’s Simon Butala were given game misconducts for facemasking, just 12 minutes into the game. - Thought the team played pretty well, the difference in the game was Swayman, who made several excellent saves. - Dressing the extra forward (Witkowski) versus an extra defenseman became an issue when Farrance was given the misconduct, since that left the team with only 5 d-men. But given that BU was playing from behind most of the game, I don't know how much Vidoli would have actually played. The bigger impact was losing Farrance on the Power Play. - The team once again struggled with the PP rush where they drop it back to a forward. I guess there must be a reason for this approach, since some NHL teams use it now, but the forwards were not making good decisions with the puck and the result was often a turnover right at the blue line. - Harper seems to have his legs back, but the Maine defensemen had little trouble knocking him off the puck. Hopefully he'll continue to improve. - While Swayman was clearly the player of the game, I thought Oettinger played well. He had no shot on the first goal (a rebound to an uncovered winger on the Power Play). The shot total for Maine (28) wasn’t high, but several of them were testing. 🚨You are playing with fire if you take a penalty against the U18s. This time it's Alex Vlasic who makes Dubuque pay. 2019 recruits Alex Vlasic and Trevor Zegras scored goals in the NTDP U18s’ 7-4 win against Dubuque. Zegras also assisted on Vlasic’s power play goal. For Team USA, it was their sixth straight win. Robert Mastrosimone, who played 4 games with the U18s at the Five Nations Tournament, scores the 2nd goal of the game for the Steel. 2019 recruit Robert Mastrosimone scored his team-leading ninth goal in USHL Chicago’s 5-3 win over the NTDP U17s, beating future teammate and 2020 recruit Drew Commesso. 2020 recruit Dylan Peterson had an assist for the U17s, his sixth point in the last eight games. Jacob Forsbacka Karlsson scored his first NHL goal in the Bruins’ 2-1 win against Arizona. Jack Eichel assisted on the tying and game-winning goals in the third period as Buffalo rallied for a 3-2 win against Minnesota. With 22 points, Eichel leads the Sabres who have won five in a row. Alex Chiasson scored his eighth goal and his second in two nights in Edmonton’s 6-3 loss to the Vegas Golden Knights. Terriers had to settle for a 3-3 tie with Vermont as the Catamounts scored with 91 seconds left in regulation. BU goal scorers were Jesse Compher, Sammy Davis and Mackenna Parker.